For years you’ve no doubt seen this smiling Life is Good guy everywhere. 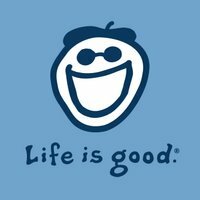 I remember seeing my first Life is Good T-Shirt back in the 1990’s and smiling. There was just something about the smiling stick figure (whose name is Jake) as he went about his life doing “good” things, from camping to biking to playing with the dog. I remember really, really wanting one of those t-shirts (and eventually getting a few). I wasn’t alone. 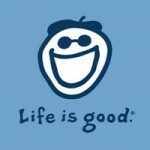 Today, the Life is Good company is a business worth more than $100 million dollars. The founders of Life is Good are two brothers, Bert and John Jacobs who in their own words “didn’t want a real job but weren’t afraid to work”. In a world where people only seemed to talk about bad news, they bucked the trends and started a brand based on optimism and fun. Clearly, they struck a chord. This book is hard to categorize. It’s part biography, part history, part self-help book, part business book, part scrapbook, part philosophy book. It’s also an art book, filled with full-color Life is Good artwork. You can learn the entire story of how the brothers grew up, how they got the idea in the first place, and how they ran their business from a tiny startup to a powerful and popular brand. The chapters are divided into different “superpowers”: Openness, Courage, Simplicity, Humor, Gratitude, Fun, Compassion, Creativity, Authenticity, and Love. But instead of spouting out theoretical and trite advice that you might find in other self-help books, they share stories from their own lives and business that show how their living out these principles ultimately led to success for them. In each chapter, they also provide practical advice on how you can apply these principles in your life. This is also not a typical self-help book that’s filled with either pedantic and didactic religious advice nor fluffy new age philosophy, and yet ironically it’s probably more helpful than either of those kinds of books. All it is is a very practical account of Bert and John’s story and simple lessons from their lives that you can apply to yours. It’s one of those rare books (like the T-Shirts themselves) where just about anyone, no matter their background, will read, enjoy, and be hard pressed to put it down without feeling energized, inspired, encouraged, and optimistic. As with all Life is Good products, a portion of proceeds goes to help the Life is Good Foundation, which partners with leading children’s charities and organizations to help the most vulnerable children in our society.